Last Saturday, Jose Aldo Junior took part in his first fight of 2019. He took on up and comer, and many believe future champion, Renato Moicano in Fortaleza, Brazil. Many expected a passing of the torch moment, but Aldo decided to use that torch to beat Moicano’s head in. Jose Aldo unleashed a storm in the second round, leading to the stoppage in front of a raucous crowd. If Aldo is to be believed, and I think on this occasion we can believe it, he will fight two more times in Brazil this year and set down the gloves. According to an ESPN article by Brett Okamoto he would even decline a title shot as it forcibly extends his contract. So if this truly is it, what does the “King of Rio” leave behind? It’s amazing what can happen in thirteen seconds. In the twelve seconds preceding the moment Conor McGregor’s left hand connected with right side of Jose Aldo’s jaw, he was considered by many to, at worst, be the greatest featherweight of all time. Some believed he was not only the number 1 pound-for-pound fighter in the world, but perhaps ever. After bursting on the scene with a nation behind him, a rapier wit and an equally sharp dress sense, Conor McGregor was heralded as the next big star for the UFC. These premonitions were, of course, correct. 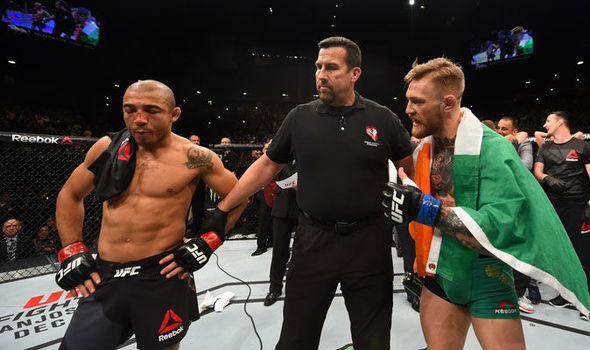 In December of 2015 McGregor took the 145 lb title from Aldo in spectacular fashion. Jose Aldo was in an interesting spot, especially considering the sheer volume of trash the “Notorious One” had been talking. If Aldo lost it was going to hurt, and he did, and it did. In the wake of Aldo/McGregor, the latter would hold up the featherweight division as he pursued a second belt at lightweight. Unsurprisingly, long time, defending champion Aldo wanted a rematch. Money talks however, and now a megastar, McGregor called the shots. He ended up fighting Nate Diaz twice at welterweight, then beating Eddie Alvarez for the lightweight title in 2016. Aldo never got his rematch, and in the eyes of many in the mainstream those thirteen seconds may as well have been a lifetime. Like so many great Brazilian fighters Jose Aldo grew up poor. He was born in the city of Manaus and began training martial arts to defend himself in the streets. Initially interested in pursuing a football career (soccer) he fell in love with combat sports. In his teens he moved to Rio, joining up with team Nova Uniao, whom he has been with ever since. I wish I could tell you to go and watch the 2016 film Stronger Than the World , about the life of Aldo, but it’s terrible, so don’t do that. After bouncing around small Brazilian promotions Jose Aldo joined the WEC roster in 2007 with a record of 10-1. His only loss had come in a lightweight fight in 2005, meaning he was undefeated at featherweight until 2015. The WEC was bought by the UFC in 2006 and housed three weight divisions: bantamweight (135 lbs), featherweight (145 lbs) and lightweight (155 lbs). Stars like Urijah Faber, Anthony Pettis, Benson Henderson, Donald Cerrone and Korean Zombie all made their names in the organisation. This is where Jose Aldo became a star. Aldo took over the promotion, going 8-0, winning the featherweight title and taking out Faber, Mike Brown and Cub Swanson, all before the age of 25. In 2010, the UFC chose to merge the WEC into the UFC, and bantamweight champion Dominick Cruz and featherweight champion Aldo would be crowned the inaugural champions of their respective divisions. Considering the UFC had a shaky relationship with lighter classes, as the lightweights had been axed years prior before being brought back thanks to the popularity of BJ Penn, this wasn’t a sure thing. Thanks to his crowd pleasing style and utter savagery, the young phenom continued his reign of terror. 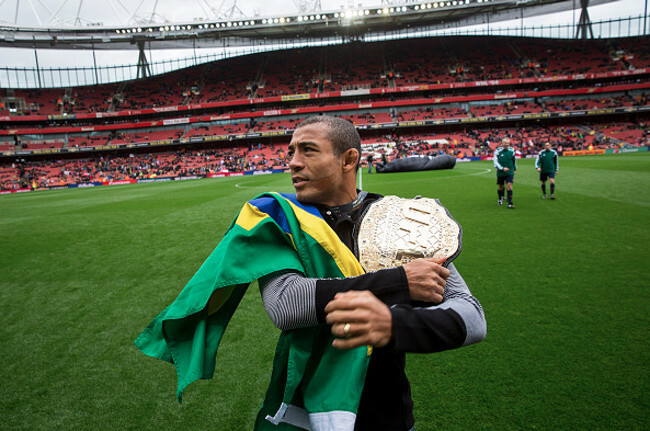 He carried the division on his back, bringing eyes to the smaller fighters, especially in his native Brazil. Five years he stood atop the featherweight heap, completing seven title defences. It’s easy to forget just how unstoppable he seemed; his aura akin to a Demetrious Johnson or a Jon Jones. A credible challenger seemed further and further from reality, until McGregor arrived on the scene. Did McGregor get into his head? As Jack Slack has pointed out, we learn nothing from a technical perspective in a flash knockout. Aldo charged in and McGregor caught him. Many touted this as a perfect example of the effectiveness of good trash talk. Aldo was clearly effected by McGregor’s words in the lead up to the fight. If Junior did indeed allow McGregor to get into his head – and that much is surely apparent at this point – then it’s a shame it had to happen in such circumstances. One moment of raw emotion and a legacy is drowned in bright lights and memes. On the June 3rd 2017 fight companion episode of the Joe Rogan Experience, Rogan made a case for Conor McGregor being the greatest featherweight of all time: “So if you said who is the greatest of all time? Well it would have to be Aldo because he beat all these guys. No, no, no, because the two of them fought and Conor merked him. So you’ve got to give it to him”. There you go – “got to give it to him,” just like that, 13 seconds and you’re out, apparently. Images courtesy of mmaweekly.com, ufc.com, fightland.vice.com and express.co.uk.